If you aim at nothing you'll hit it every time! The blog of William Albaugh Jr. Xerox, Apple, MAC, PC's, Photography, Technology, Flying, Family, God. All the essentials. Age 21, 185 lbs......Age 40, 185 lbs. Not an accident. Yep, that's me! The year I turned 40. My primary job besides being a husband and father is that I am a Senior Sales Engineer for a large Xerox Agency in central Ohio. In addition, I am a professional personality consultant and speaker since 1994. You should find a list of things I do or like on the left hand side of my blog. Use those key words to search for past posts that I have made about those subjects. Trash to treasure, junking, shabby chick, re-purposing. All of these terms help to describe an obsession that my wife Mollie exhibits. Taking somebody's trash and transforming it into a modern day piece of functional art and or decoration is Mollie's extreme hobby of choice. d have never in a million years thought that a hundred year old shutter would make a good bill / mail organizer. Nor would I haver ever taken old fashioned hand drills and bolted them to a piece of wood to make a coat rack. However, despite this deficiency I am certainly able to appreciate the beauty of the completed projects. I am equally if not more so appreciative of my wife's eye for junking and her passion for it. It amazes me how God had made us just enough alike to make our marriage work and so completely opposite in other areas that make our marriage quite interesting and enjoyable. 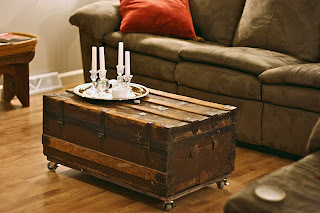 Mollie has always wanted to turn an old trunk into a coffee table. Two weeks ago while surfing on craigslist, she found this old trunk along with several beautiful white linen table covers. Cost: $20.00! We bought some casters at Lowes and I attached them to a wood frame that I then attached to the bottom of the trunk. Ta Da! A $30.00 coffee table that you can't find in any store that we know. We are contemplating adding a glass top to complete the table in the near future. I love this trunk! My first thought when we finished it? I wonder how much we can sell this thing for????? Bill, great title and I love the new blog. Props to Mollie for her eye for design on a dime. Looks great.